Dressing: Combine all ingredients in blender or food processor and purée. Chill. -trim fat from flank steak and score both sides (make 1 inch cuts from top to bottom). Place in ziploc bag and add 1/2 cilantro dressing and marinate 20-30 min. - Remove steak and spray pan with cooking spray and add all other ingredients except lettuce! Cook for 3-5 minutes. 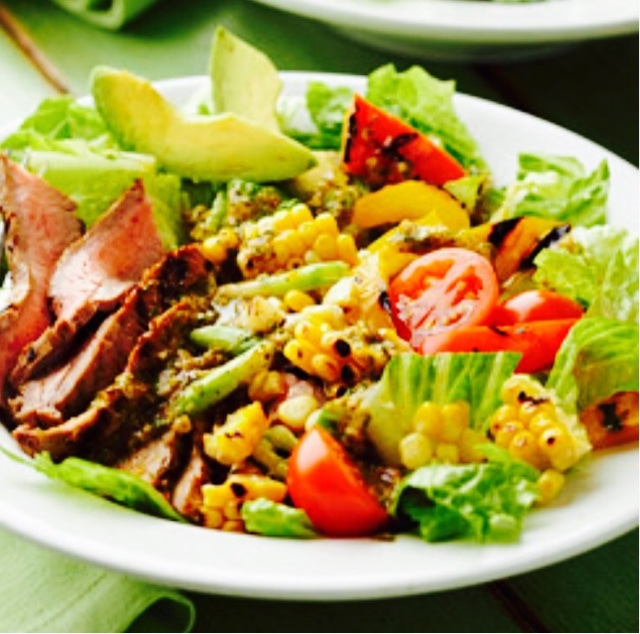 - Prepare lettuce in a bowl, add veggies and steak and top with remaining dressing!